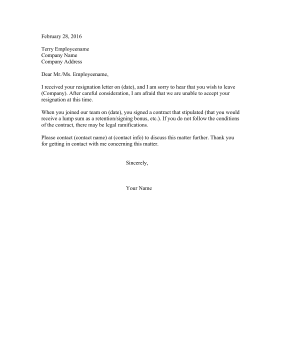 This printable letter rejects an employee's resignation on the grounds that the employee accepted a retention bonus. I received your resignation letter on (date), and I am sorry to hear that you wish to leave (Company). After careful consideration, I am afraid that we are unable to accept your resignation at this time. When you joined our team on (date), you signed a contract that stipulated (that you would receive a lump sum as a retention/signing bonus, etc.). If you do not follow the conditions of the contract, there may be legal ramifications. Please contact (contact name) at (contact info) to discuss this matter further. Thank you for getting in contact with me concerning this matter.